Reports have been mixed about whether the hotel is truly that much more enjoyable for women to stay in—it’s got a number of room design choices, like bigger closets, a bench to make it easier to shave your legs in the shower, and peepholes in the doors, that are supposed to make women feel comfortable and safe. Overall, their emphasis seems to be on being a very cool hotel: The company has also started hosting a video series where fans interview celebrities like Miguel, and has emphasized how social and fun their entertainment options are, from their coffee shop to their “speakeasy” bar. Visuals and aesthetics are obviously very important to the overall Virgin brand; Virgin Airlines flight attendants are given hair and makeup lessons. Apparently this devotion to a specific look has rolled over to their hotels too, as this email from a tipster reveals. It was sent by Virgin Hotels Chicago’s Director of People to the “good looking ladies” of their “front of house team”—defined here as “rooms, servers, hosts, spa, sales, etc.”—as a non-mandatory but suggested activity. The objective of this class is to be able to provide different hair styles and general make-up tips to the Virgin ladies. Although the class isn’t mandatory, we would like to have as much participation as possible. In addition, we will need 2-3 volunteers to have their hair styled and make-up done. Please let me know if you have anyone interested in volunteering by Friday. I will need to get a list to the instructors, so if you could give me a list of names that will be attending by Friday as well, it would be much appreciated. Our focus for these classes is primarily for the front of house team (rooms, servers, hosts, spa, sales, etc.). If you have any questions as to whether your team should partake, please let me know. We’re at the very first steps of building our grooming program, for both men and women, similar to what our sister companies have successfully done. The first set of classes, which are voluntary, will include our front of house employees, those that engage with customers and are considered the face of our brand. We’ll then involve all employees if they choose. It’s intended to be an educational class on new make-up and hair tips and styling techniques. We’re excited to kick this off and think our employees will enjoy it. I want to clarify the “You are so good looking” response. One of your readers actually called out the origin…Seinfeld. We love the show and often quote many of its memorable lines. It’s an internal line that we have fun with. She also included a screenshot of said Seinfeld reference. 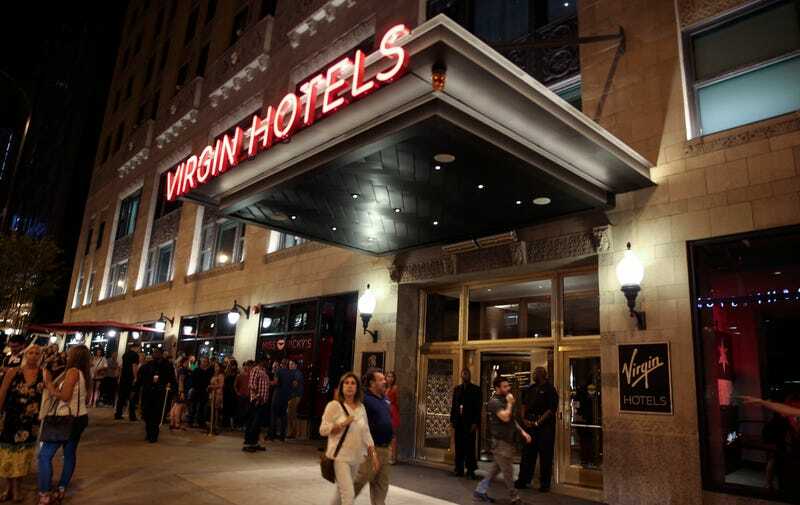 Virgin Hotels has several other locations opening in the next few years: Nashville, New York and Dallas.